With so much time spent in front of screens, it’s no surprise that our attention spans are getting shorter, our sleep is getting fitful, and our anxiety is climbing. What’s worse, our children are suffering from obesity, they are losing valuable life/preparedness skills, and they are out of touch with the rhythms of nature. We all know there is more to life than sitting inside. It is time to consider getting back to the very core of what family time is about – reconnecting with one another by doing activities together. Summer is the perfect time to disconnect from Netflixing and our computers and get outside. Author Richard Louv’s groundbreaking book Last Child in the Woods touches on all of the benefits that come from getting kids off of the couch and outside. But how do you compete with electronics and entice a kid to spend time outdoors? 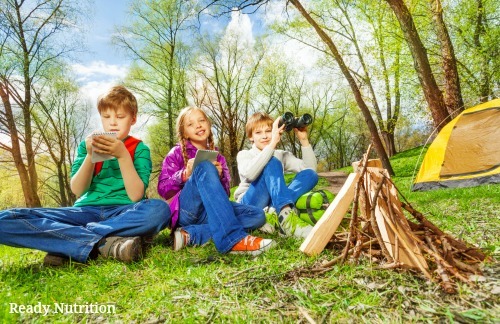 Here are 5 tips to get your kids back to nature. Plant a seed: If you already have a garden, this one is easy, but all you need is a little piece of dirt to get started. Simply allow your child to pick out a flower, fruit, or vegetable of their very own and plant it in a suitable location. Encourage children to do their own research about which plants will do the best in their region and at this time of year. Try not to intervene too much—put your child in charge of planting, watering, marking, and watching their seed sprout and grow. Kids will take pride in knowing that they’ve succeeded in growing something and checking on their plants every day will give them a reason to get outside. Sleep outside: have kids take their bedtime routine to the great outdoors. Set up a tent, gather some flashlights, and maybe even pack some fun snacks. Younger kids will of course need mom or dad to stick around while older kids can feel a sense of pride for staying outside all night (obviously a fenced yard is preferable if you’re going to be letting them try this solo). Build a fort or shelter: all it takes is a trip to the hardware store for some plywood and 2x4s (or get creative and recycle an old bookshelf or other piece of furniture) and a little imagination and your kids will have a secret lair or fairy fort. Let the littles create a blueprint and then watch them bring it to life. Younger kids will need help wielding tools but in a pinch even a cardboard structure can be a fun (and temporary) feature in your backyard. Start a collection: a leaf, flower, or rock collection is a great way to encourage kids to forage in the yard. Press leaves and flowers between the pages of a book before pinning them in an album. Rocks can be painted or polished and featured in a shadow box or glass jar. Remember that kids look to adults to learn how to regard the natural world. If they see you enjoying your coffee out on the porch swing or spending time decompressing on a walk around the neighborhood, they will look to nature as well.